CHAMPION: Noel Bratt (left) is presented with his trophy by seniors club treasurer Terry Sambridge. The 2018 trophy winners at Tydd St Giles Golf Club got their hands on silverware at the recent AGM and presentation night. The award winners were as follows: Alf Bishop trophy winner – Peter Wheeler’ Pestys pot winner – Steve Fox; Ged Taylor trophy winners – Lee Newman, Peter Wheeler, Tim Martin, and John Gamble; Rabbits Cup Winner – Toby North; Seniors Intermediate Cup – Tim Martin; Captain’s Day winner – Peter Wheeler; Wrinkly Cup winner – Dave Punshon; Order of Merit winner – Andy Stacey; Easter Bunny competition winner – Gary Brown; Single Match Play champion – Michael Flint; Champion of Champions – Malcolm Miller; Seniors Club Champion – Noel Brat. 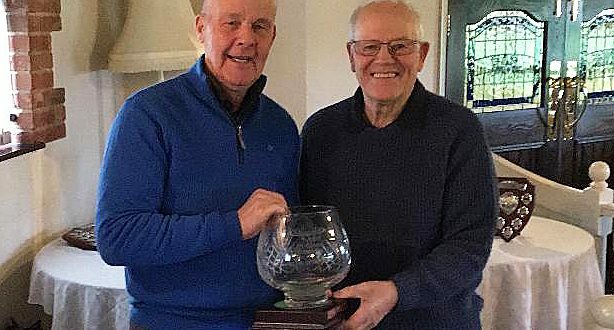 Results: Seniors’ section: Stableford Trophy competition: Division One – 1st Peter Wheeler 38pts; 2nd Chris Moore 35pts; 3rd Brian Newby 33pts (ocb). Division Two – 1st David Pluck 32pts (ocb); 2nd Tom Ainsley 32pts; 3rd Ron Colledge 30pts. Division Three – 1st Kevin Merrison 32pts; 2nd Bob Mann 31pts; 3rd Garry Brown 29pts (ocb). Division Four – 1st Chris Woods 36pts; 2nd Salvatore DiBella 32pts; 3rd Dennis Boone 31pts. Men’s section: January Pairs Texas Scramble – 1st Simon Smith & Dean Wright 59; 2nd James Dack & Jonathan Tyler 61.5; 3rd Wayne Alder & Andy Sleath 62; 4th Paul Chaplain-Barton & Isaac Chaplain-Barton 62.2.